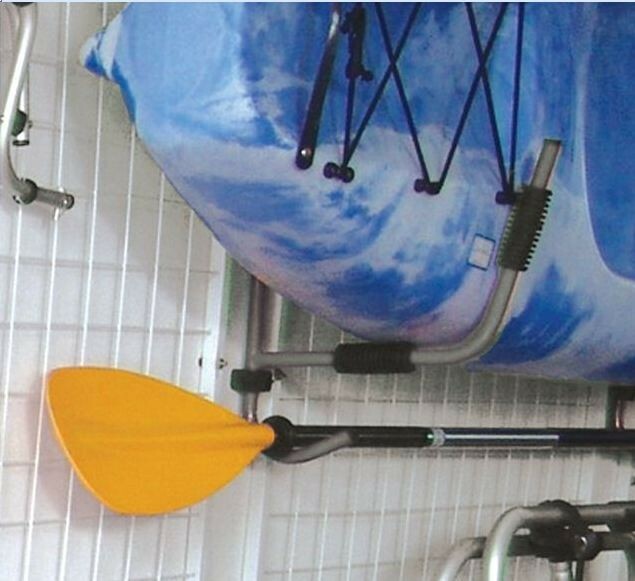 The Deluxe Folding Kayak Storage Wall Hook Set is a step up from our basic kayak wall storage hook set. The unique design allows you to fold the storage arms against the wall when not in use and we've even included an accesory bar below the main storage hook for storing a paddle or hanging other accessories from it. We utilize the same durable rubber boots that we use on our kayak carts to ensure a soft contact point between the storage hooks and your boat and you can adjust the boots as needed to fit your specific boat. 200 lb weight capacity. Each Hook is approximately 17" x 15" x 2". 5lbs weight.